Most users who buy computer are just paying notice to the speed (how fast) and size of RAM memory (how big) of the PC. In fact, most modern CPU microprocessors have great lots of features and capabilities other than constantly higher clock rate. With the evolving of software development, some of these features are now required. With SecurAble, user can easily check and determine if the system is x86 or x64 architecture, support hardware DEP and/or hardware virtualization. All these features are deemed to be security-important by developer of SecurAble, GRC. 64-bit capable CPUs have the ability to run the 64-bit versions of Microsoft’s substantially more secure Windows XP, Windows Server 2003, Windows Vista, Windows Server 2008 and Windows 7 operating systems, which has the operating system kernel locked down. Hardware-enforced DEP can stop exploitation of buffer overflow attacks, while virtualization technology (VT) can be used to create fully contained environments that can be used to insulate the real hosting operating system from any actions taken by software running within the “virtual” environment. 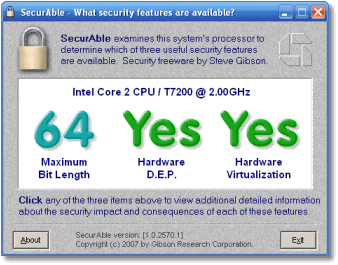 SecurAble is free to use, and no installation require.